Paul Pogba bagged a brace as Manchester United ran out 2-1 winners against West Ham in the Premier League. There’s no denying his quality but levels of consistency could definitely improve. Although his performance didn’t contribute to any goals against Barcelona, the Frenchman showed that he could be a driving force entering the final third from United’s midfield. Sergio Busquets struggled and picked up a yellow card for his struggles. Then on Saturday against West Ham, Pogba was there to save the day for United, scoring twice from the penalty spot. 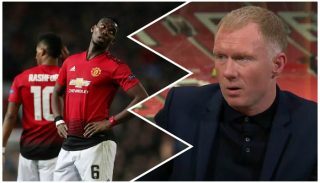 Yet Pogba has been guilty of slipping into his old habits and Scholes has said as much, as quoted by the Daily Express. “I want to see the Paul Pogba that started when Ole came in. His first six of seven games, I’ll stretch that to 10, 11 games. “He seems to be slipping into his old ways a little bit. “Taking too many touches on the ball, not passing and he needs to get back to it. We know what quality this player has, he’s such a powerful player. He can strike a ball, he can make a goal, he can score goals. If Pogba is to warrant a new long-term deal, as reported on Saturday by The Standard, he must bring consistency to the table. The same goes if he expects a mega-money transfer to Real Madrid at some point. Pogba has previously admitted it would a “dream” to play for the Madrid club, while there has also been speculation about a return to Juventus. But United are not in a position where they must sell their most valued assist. He is under contract until 2021 and could be in line to become club captain when Antonio Valencia leaves this summer.